The adoption of firearms by American Indians between the seventeenth and nineteenth centuries marked a turning point in the history of North America’s indigenous peoples—a cultural earthquake so profound, says David Silverman, that its impact has yet to be adequately measured. 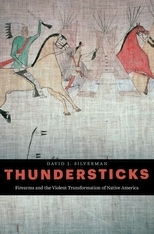 Thundersticks reframes our understanding of Indians’ historical relationship with guns, arguing against the notion that they prized these weapons more for the pyrotechnic terror guns inspired than for their efficiency as tools of war. Native peoples fully recognized the potential of firearms to assist them in their struggles against colonial forces, and mostly against one another. Though American tribes grew dependent on guns manufactured in Europe and the United States, their dependence never prevented them from rising up against Euro-American power. The Seminoles, Blackfeet, Lakotas, and others remained formidably armed right up to the time of their subjugation. Far from being a Trojan horse for colonialism, firearms empowered American Indians to pursue their interests and defend their political and economic autonomy over two centuries.